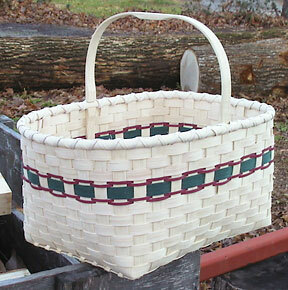 Size: 13" x 10" (base) Height: 15"
Originally made for Michael Sims' niece, Melissa, in December 1999, this popular basket is generously sized and easy to make. It's a great beginner project. Tools needed: Scissors or Shears, Pencil, Chip Carving Knife or Hand Plane, Clothespins (spring type), Container to hold water, Measuring Tape, Basketry Packing Tool or Bone Folder, Plastic Twist Ties or Cable Ties, Spray bottle for water. Calculate Supplies for 1 to 20 Mellisa Baskets with the Basket Supply Calculator. The Supply List gives you the least expensive way to purchase the supplies for your quantity of baskets. View on-line or print to your printer. *This item has been rounded to 1 pound / coil because it is less expensive to purchase 1 pound than to purchase the foot quantity.